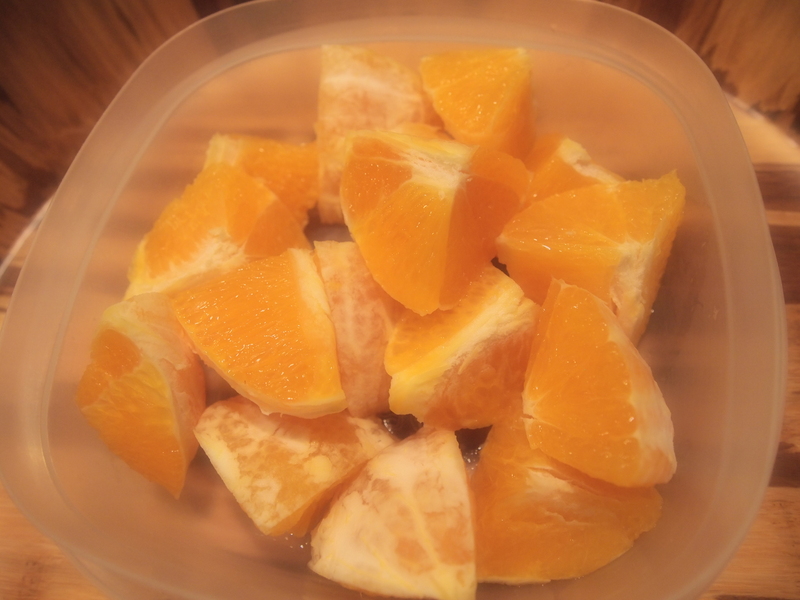 Here’s a healthy and simple raw lunch I have just finished preparing and packing to take with me to work tomorrow. I get such a kick out of preparing my lunch and snacks especially when they look this yummy 🙂 It reminds me of my childhood and being a student in primary school. I hated the lunch my school served so I packed my own lunch (most days) and snacks. School lunch was usually under or overcooked and lacked any flavor whatsoever but it was prepared from scratch with real whole foods. In hindsight it was definitely so much healthier than what most public schools serve children here in the US, hence the childhood obesity epidemic. If only everyone listened to Jamie Oliver. Snack time & Lunch time, at work now, are still one of my favorite parts of the day so why not take the time to prepare something tasty and healthy for the day ahead or early in the morning if you can manage that. 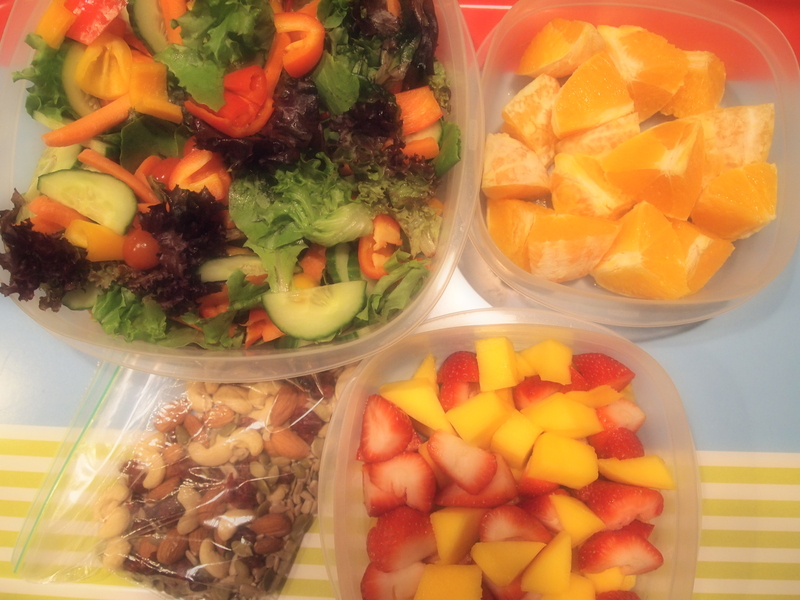 A longer work day means you should pack even more food so as not to succumb to temptation. Don’t forget to hydrate 🙂 with water and your favorite no-fuss juice recipe. Are you salivating like I am? What are your favorite easy peasy healthy and simple snack and lunch ideas? I think the best motto for trying to lead a healthy lifestyle especially with food is… Keep it Simple and Keep it Real! (and organic if possible :-)) Hubby and I had snack time one lazy afternoon this past summer that was just too pretty not to photograph! 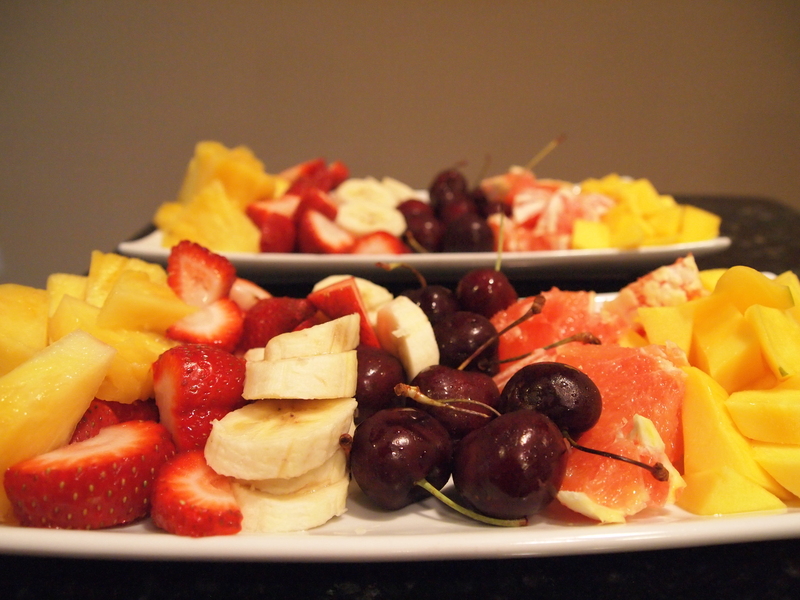 One of my absolute favorite things about summer is the abundance of fresh fruits. This was the most delicious snack time we’d had in a while. It had me thinking of how incredibly delicious real food is and how grateful I am we get to indulge. Here’s to keeping it simple and real with all our meals! 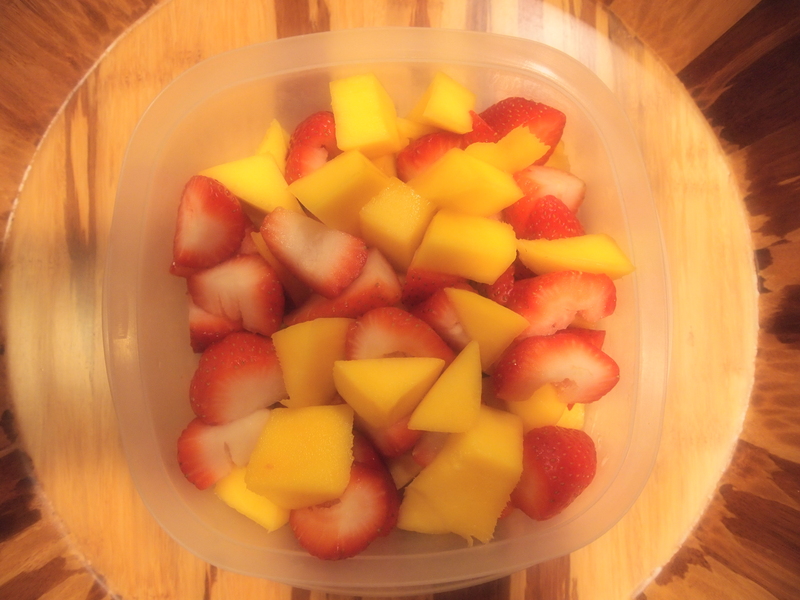 Ingredients: Pineapple, Strawberries, Bananas, Cherries, Grapefruit and Mango. Use your favorite fruits, especially what is in season since it tends to be the most affordable and have the most nutrients. This is a great breakfast recipe too! Here is the best thing that came out of week 2 of my New Year, New Me 6 week plan. I thought of waiting till the 4th of July to share it with y’all but that just feels like light years away! 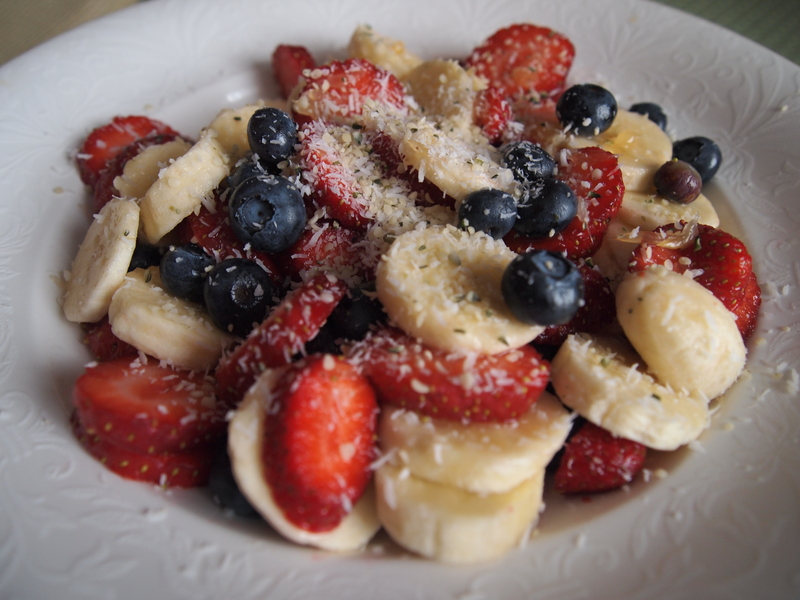 It’s a recipe I have dubbed Freedom Fruit Salad for it’s gorgeous red, white and blue colors. It’s not just beautiful, healthy, raw, organic, vegan but also out-of-this-world delicious and so easy to make. It’s the perfect healthy raw breakfast recipe, healthy snack or even main meal if you make a large portion of it. Here were the ingredients to this recipe that literally had me dancing in the kitchen as I devoured it. All ingredients are fresh, not frozen. I don’t need to give directions, do I? (Throw everything in a bowl and stir!) It’s the easiest, tastiest and most original breakfast recipe I have made in a while. I was in and out of the kitchen in 5 minutes. The last two ingredients are optional but really add a wonderful dimension to this recipe. If you don’t have them, the recipe is just as tasty but feel free to get creative with what you have in your kitchen. Clementines are not safe in our house. I bought a box of them and between my husband and I they were gone in four days. I don’t know how many the box holds but I would estimate probably about 35. They were perfect to have for breakfast, as a snack and as you will see in today’s post, they were a great addition to this salad. 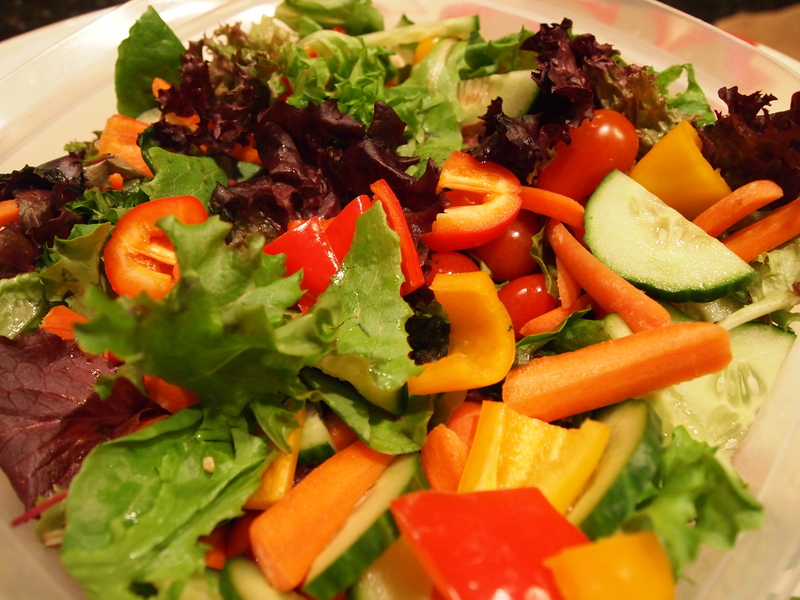 This salad was incredibly filling, delicious, crunchy, sweet and a little tangy thanks to the yummy dressing I used. Yup! That’s it! Simple is best. I used Cindy’s Kitchen Sundried Tomato dressing which I purchased at my local Whole Foods Market but feel free to use whatever dressing you have on hand or better yet make one. Clementines have Folate, Potassium, Fiber and are of course loaded with Vitamin C.
Here’s a new green juice recipe I made this weekend that I absolutely enjoyed and wasn’t too ‘green’ tasting. 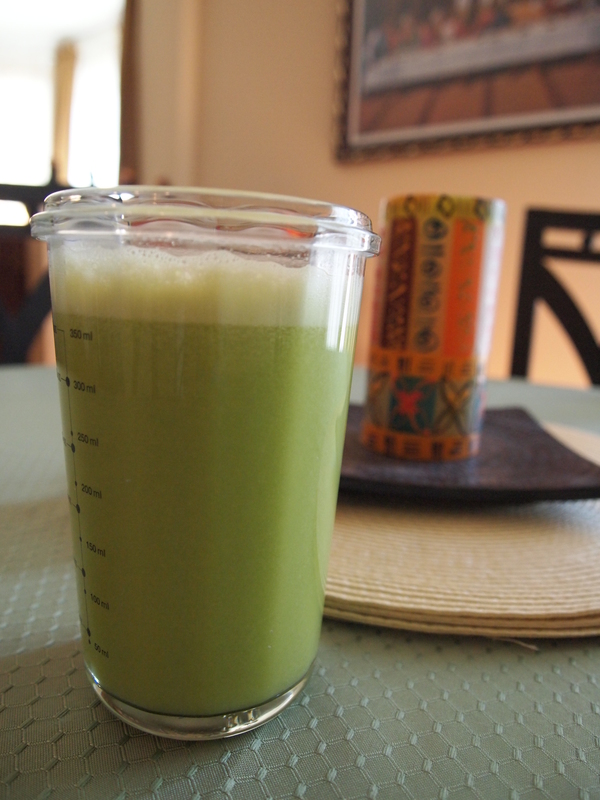 While I can usually tolerate the greenest of juices I realize many can’t, especially those new to juicing. So in an effort to convert as many people to my green-juice-loving cult I am making an effort to create veggie and fruit recipes that are light, tasty and refreshing. This recipe fits that bill to a T! This should make somewhere between 14-16 ounces. I’ll definitely be making this recipe over and over again. PS: I called it my Sunday snack because I drank it this afternoon/evening while trying to figure out what to make for dinner. It filled me up and kept me thinking straight so I could make a healthy choice. Yay Juice! When I am on my laptop, anyone that knows me knows I am constantly browsing the web for articles, videos and blogs that relate to living a healthier lifestyle by incorporating nutritious, delicious and lately… raw foods. I do not ascribe to any particular diet and never have. I simply eat what tastes divinely delicious, makes me feel ALIVE and what I truly believe is made with whole and preferably organic foods… most of the time. I’m human ok. Lately that has meant trying to incorporate as many raw fruits, vegetables, nuts and seeds into my daily meals and it is so much fun! The universe must be trying to send me a sign of some sort because in my browsing adventures I have come across lots of muesli recipes. I ate muesli when I was younger every once in a while. It was pretty expensive so it was actually quite the treat to have it in the house. The truth is though that my ‘oatless’ muesli should not even be referred to as muesli because it contains none of the ingredients from Bircher-Benner’s original muesli recipe. 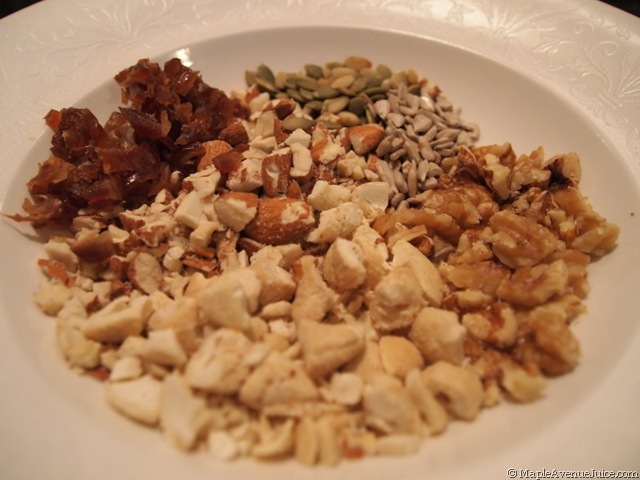 Any combination now of oats, nuts, seeds and dried/fresh fruit seems to be referred to as muesli so here’s my ‘oatless’ muesli recipe that I created with the nuts and seeds I had in my kitchen. Please note that all nuts and seeds in this recipe are raw. 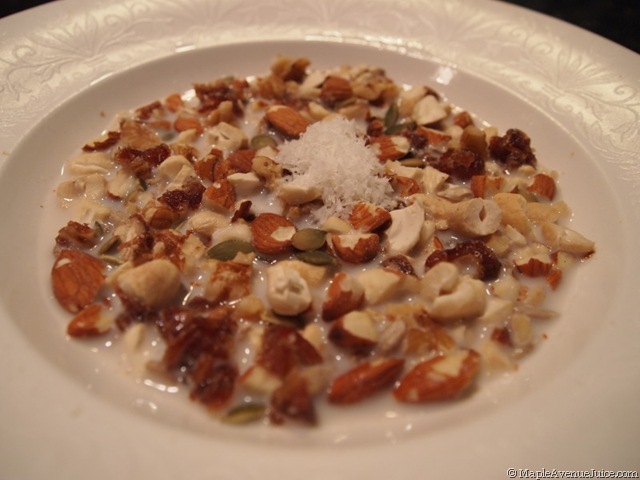 Serve with cold homemade almond (or your favorite) milk and enjoy! This was so good and incredibly filling. I can’t wait to make this again. The focus of this blog is that natural wholesome foods are not only the healthiest kind of foods we all should be eating but that they are easy and delicious to prepare awesome recipes with. It doesn’t get any easier than purchasing some of your favorite nuts and seeds and munching on them as a snack any time of the day to stave off the hunger. 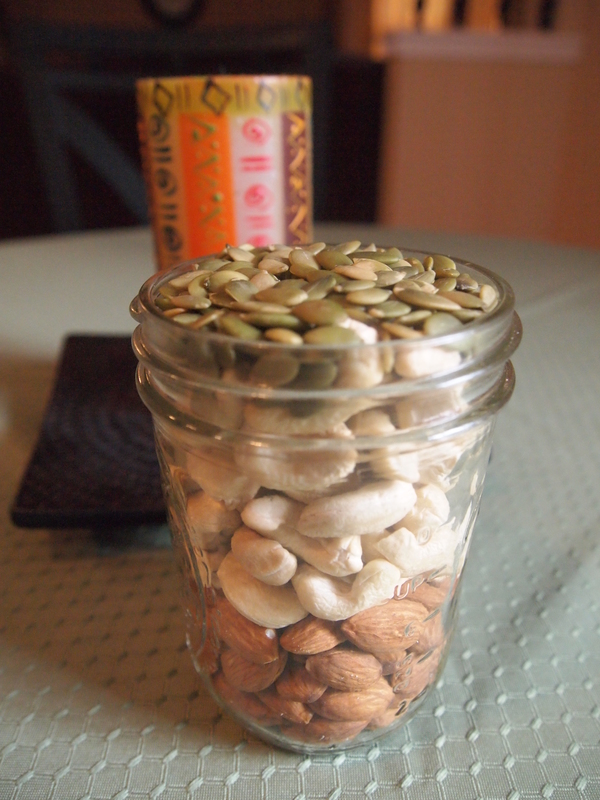 Here’s a pic of my favorite raw nuts, almonds and cashews, as well as some pumpkin seeds right on top which I enjoy as well. Nuts are full of heart-healthy monounsaturated fats, vitamin E and many other nutrients, all of which create optimal health. 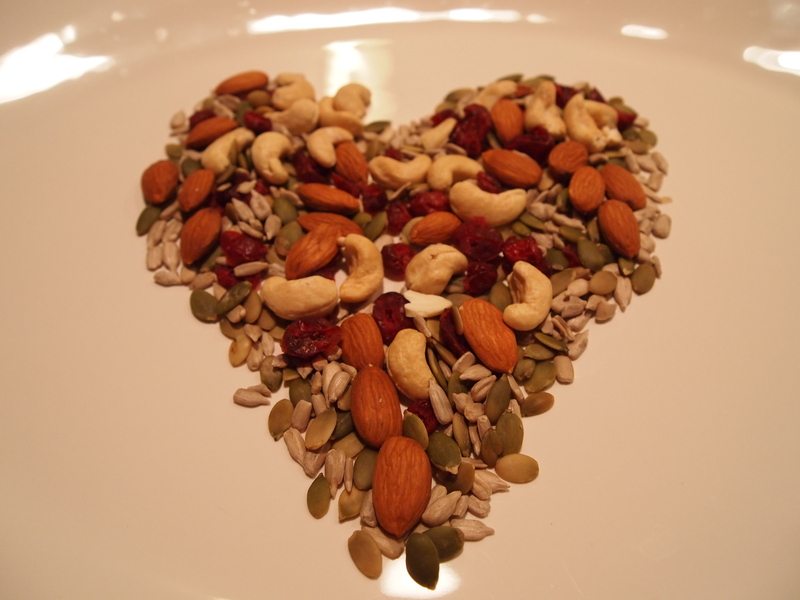 I’m nuts about nuts (and seeds), are you?